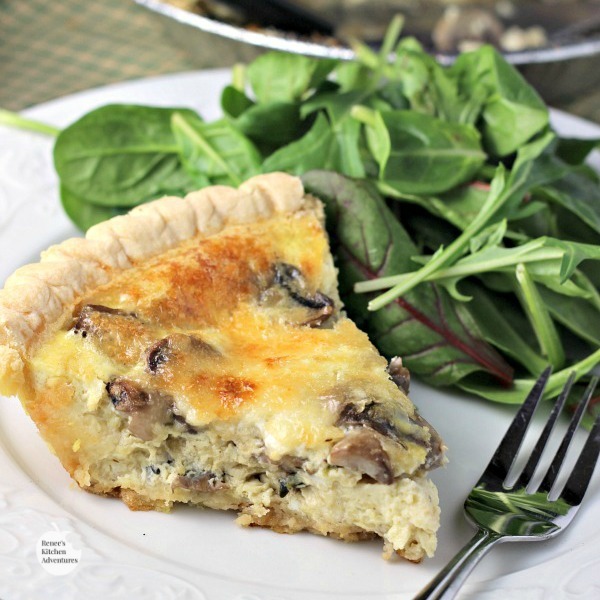 Mushroom Swiss Quiche is a meatless option (vegetarian) that makes a wonderful breakfast, brunch, lunch or dinner. Served warm or at room temperature, it's a classy way to enjoy eggs! This week's Sunday Supper theme is "pies." I cannot think of a more delicious sort of "pie" than a wonderful quiche. When most of us think of pies (myself included) dessert pies come to mind. While I think fruit pies and cream pies are wonderful, I wanted to make something more non-traditional this week. I think a quiche fully qualifies as a pie. It does have a wonderful pastry crust and a delightful filling. Homemade pastry crusts are great but don't discount the frozen pie crusts of today. They are flaky and delicious and almost as good as any homemade pie crust I have ever had. Plus, you cannot beat the convenience. Two quiches are better than one! This recipe makes two 6-serving quiches. That is great news, because you can either feed a crowd or freeze the second one for another meal. This recipe freezes wonderfully! Cook once, eat twice! Great meatless option for anytime of the day! During this time of year, many of us are searching for meals without meat. My family loves this quiche because the mushrooms give it a sort of hearty "meaty" feel, without the addition of actual meat. Quiches can be eaten any time of the day. I like to pair mine with a garden salad for a great brunch, lunch or dinner option. If I serve it for breakfast, I make some breakfast potatoes to go along side. And...did I tell you it tastes great too? 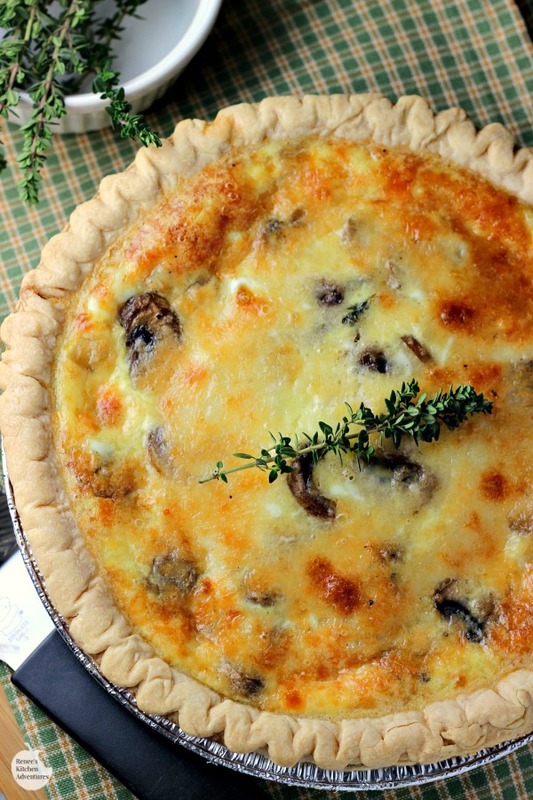 My family is always happy when I make them quiche and this Mushroom Swiss one is a winner! A great meatless option for breakfast, lunch or dinner. 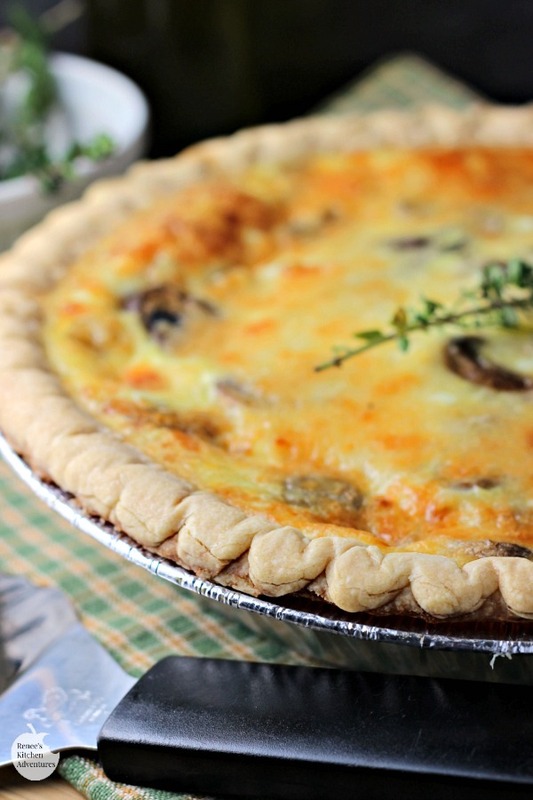 Mushrooms give this quiche a hearty "meaty" quality while staying vegetarian. In a large skillet, heat the 1 TBS butter. Add in the shallots and saute until they start to become translucent. Add the mushrooms and thyme to skillet. Stir and cook until mushrooms are no longer raw and most of the moisture is absorbed. Sprinkle with 1/2 tsp. kosher salt and add in the sherry. Stir to combine and continue to cook until sherry has absorbed. Take off heat and set aside. In large glass measuring bowl or large bowl, whisk together the eggs, milk, flour, 1/2 tsp. kosher salt, ground pepper, and Dijon mustard. In small bowl combine the cheeses. Begin to assemble the quiches by layering 1/4th of the mushroom mixture into each pie shell. Followed by 1/4 of the cheeses, then 1/4th of the egg mixture and repeat layers until all ingredients are used up. Bake quiches on a baking pan in oven for 40 - 45 minutes or until set. Allow to cool at least 10 minutes before serving. Can be served warm or at room temperature. Second quiche can be frozen for later, if desired, by wrapping well in plastic and foil. When ready to reheat, thaw and bake at 350 degrees F for 20 -30 minutes, or until heated through. Be sure to check out all the #SundaySupper Pies: Sweet & Savory! Looks good! A nice quiche is always good, and so flexible when you have it. Mushroom and Swiss cheese are a combination made in foodie heaven. I can't wait to try this! Mushrooms are a fantastic meat substitute...At Japanese markets we have varieties of mushrooms which I'd love to try in your scrumptious looking recipe! I love having more meatless options and even better that you can cook once and eat twice! Fabulous combination! Thank you so much for sharing! I love a good quiche and those big bites of mushrooms sold me on yours! It looks perfect!!! Mushroom and swiss is my favorite combo! This is the perfect brunch, it's beautiful, impressive and something I can make in advance. Love this and pinned! The oven temps for "just baked" and "earlier pre-baked" pie crust are the same. What should the earlier pre-baked oven temp be lowered to, 325? Thanks so much. Thanks Marsha, sometimes what seems clear in my head, doesn't always translate that way! haha I find that most frozen pie crusts need to be baked at 400 degrees F, hence the need to turn down the oven to 350, if you've just baked them. Just follow the directions to bake an empty crust on your package of frozen crusts. The oven temperature to bake the quiches is 350 degrees. I hope that clears it up! Looks like a pie to me! My husband would love this recipe. Quiche is one of our favorite comfort foods! Yours looks delicious! 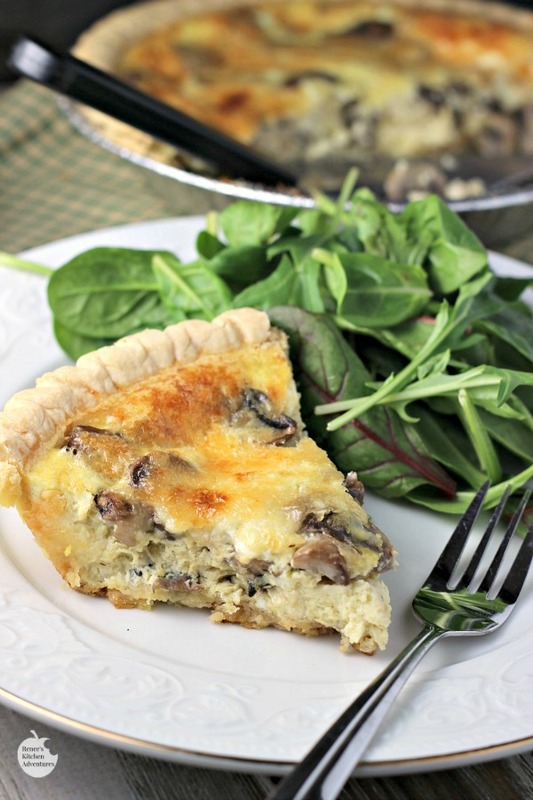 Love mushrooms in a quiche! Yours looks so good!